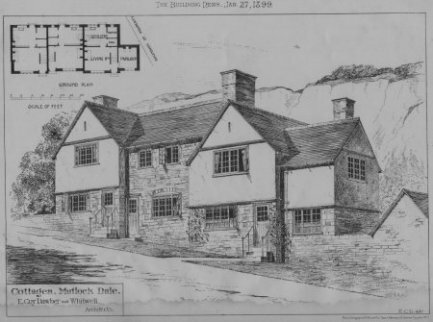 Dated Jan 27, 1899 from "The Building News", entitled "Cottages, Matlock Dale." Do these cottages still exist between Matlock Bridge and Matlock Bath? 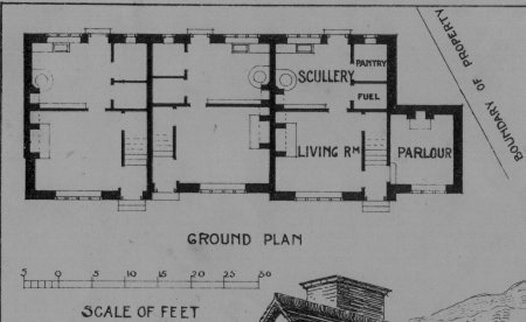 Plans of above cottages. Not large with Victorian furniture. 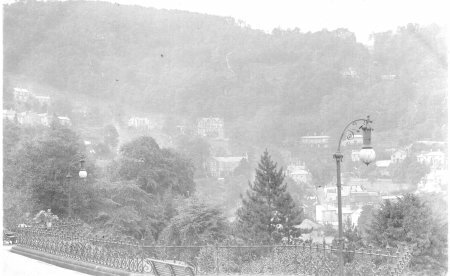 Unposted, about 1905, probably a view from some Building in Matlock Bath, but which? Probably from the balcony of the Royal Hotel, burned down in 1929, see the email below. Posted 1903 from Matlock Bath to Accrington. No building like this is known in Matlock or Matlock Bath. Yes, the house is Upper Rosskeen. It is on Surgery Lane as Stuart so rightly says. It does not look quite the same now, as it did in the photograph. The tudor-like woodwork has gone, and it perhaps in that sense has lost a little bit of its charm. It was used in Peak Practice, for episodes in which Maurice Denham played a prominent part. It is now, at least some of it, a guest house providing b&b. Friends I know who have stayed there speak very highly of it in that respect. Stuart mentions Dr. Twist, he was indeed part of a medical practice that used to operate from Upper Rosskeen. His partner was Dr. Ward. John Twist lived in a house attached to Upper Rosskeen, just to the right of what you see in the photograph. Prior to Dr's Twist and Ward there used to be a Dr. Mcdonald, he had a daughter who also became a doctor, Dr. Eileen McDonald. She it was, as I understand it, who was the doctor that attended my mother when I was born (Dec 29 1944). 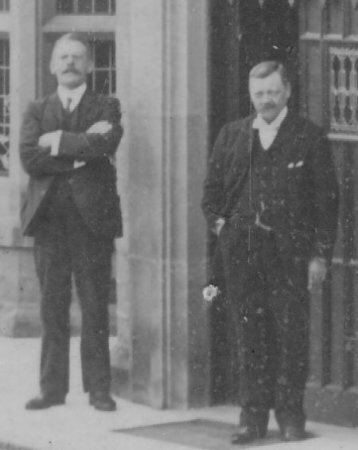 If I am correct, and I believe I am, Dr. McDonald, Eileen's father, is one of the men standing outside Upper Rosskeen in the photograph you have. [see enlargement] I am not sure who the second man is. My grandmother used to be "in-service" with Dr. McDonald, and used to tell of the wonder in the village when Dr. McDonald obtained what was probably one of the first motor-cars in the community. These pictures have been obtained by the author, but he does not know what they show. Any help gratefully accepted. Posted 1923. 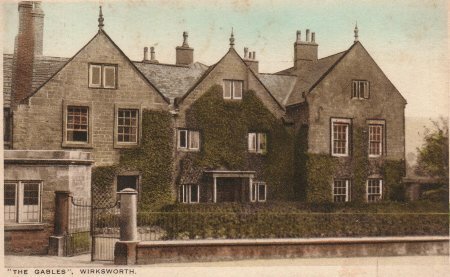 "The Gables, Wirksworth". But where? neatly trimmed back between 1923 and 1935. 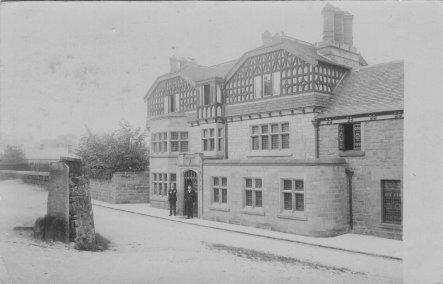 Could it be the Old Manor House on Coldwell Street? Yes, it is! I've just contacted The Old Manor House website, the owner tells me it used to be called "The Gables", and was covered in Virginia Creeper. 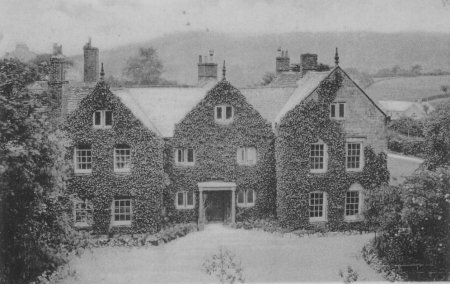 The house dates back to 1680. I hope he sends me more info, I might be able to track the owner in 1680! "A large early Victorian stone built residence of great character dating back to 1843"
Enlargement. Which man is Dr McDonald?